Palm, Treo, Pockets PC, Windows Mobile, BlackBerry, Smartphones & many more. We have adapted the content from e-AA to work on almost all PDAs and handheld computers. BlackBerry Pearl, Curve, Bold, Storm, Flip, 8800 etc. Palm treo, pre, centro, Tungsten etc. Windows Mobile, Pocket PC, iPaq, Axim, Franklin BlackJack- etc... it just doesn't matter. This replaces PalmAA, and PocketAA and adds support for BlackBerry - one set of files for nearly any device! Supports bookmarks, notes, highlighting and searching. Text comparisons: the changes made to the main text. We implore you to try the demo before buying. we can not provide tech support - even if you buy a copy. BlackBerry Vital Note: Download can't be done using a BlackBerry - please download to a regular Windows PC. 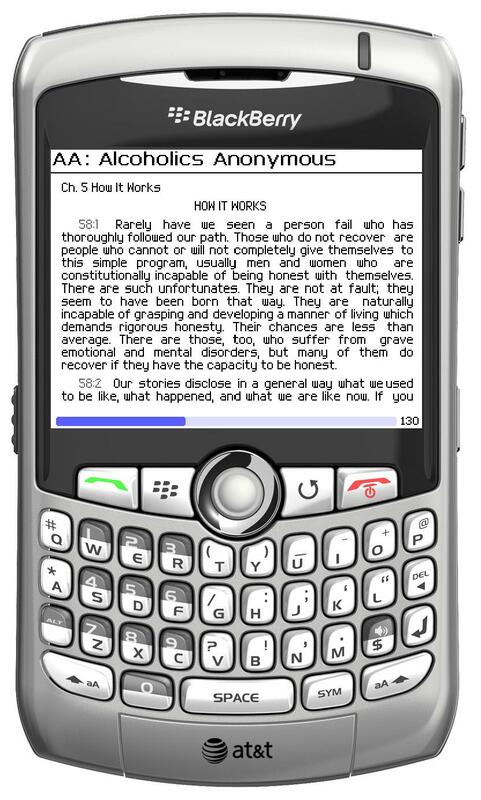 While the book will run on a BlackBerry installing the software and synchronizing the content to the BlackBerry is handled by the Windows version of Mobipocket Reader. The Reader is available at this link. "Big Book" has been registered as a trademark by AA World Service.